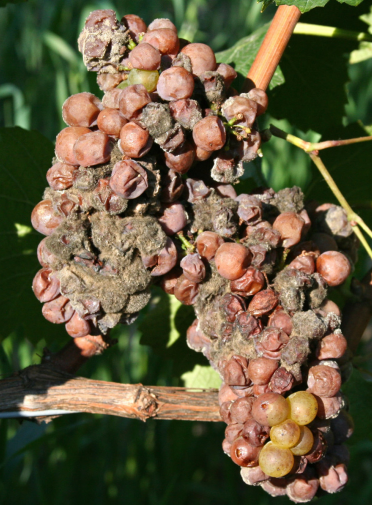 Botrytis bunch rot (BBR), caused by the fungus Botrytis cinerea, causes damage to ripening grape clusters throughout the temperate regions of the world where pre-harvest rains occur. Although pure Botrytis infections free of secondary contaminants can sometimes produce the so-called "noble rot" integral to the production of certain prized dessert wines, a far more common result is a disease that reduces both yield and fruit quality, as infected grapes typically produce wines with substandard flavors and appearance. BBR is an amazingly complex disease. Its development is governed by multiple 3-way interactions between the grapevine, the environment, and the Botrytis fungus itself, many of which are poorly understood. This article will attempt to summarize the work that our research group has undertaken in an effort to better understand the fundamental principles underlying BBR development and apply this knowledge to its management.